Effectiveness of these agents and their combination for 60 days. Clinically, the management of dentin hypersensitivity addresses its etiological and predisposing factors. Treatment is always aimed to alleviate the pain and concern of the patient. The second group consists of potassium salts and Pashley suggested KNO3 works by potassium salts reducing the excitability of the pulpal nerve fibers. Dentifrices containing potassium ions have been shown by several clinical studies to be effective in reducing dentine hypersensitivity and the American Dental Association Council on dental therapeutics has granted a seal of acceptance to dentifrices containing 5% potassium nitrate (Council on Dental Therapeutics 1986). Potassium nitrate is used either in toothpaste or mouthwash. Literature shows that both the formulations have therapeutic potential to alleviate dentinal hypersensitivity. Recently, bioactive glass (BAG) has been incorporated in dentifrice as a tubule occluding agent for treating dentin hypersensitivity. BAG is a ceramic material consisting of amorphous sodium calcium phosphosilicate which is highly reactive in water and the fine particle size can physically occlude dentinal tubules. NovaMin and SHY-NM are some commercially available toothpaste containing BAG. A study done by Gillam et al. showed that BAG had desensitizing action. A clinical study has proved that the NovaMin was more effective in reducing sensitivity compared to other commercially available dentifrices. The present in vitro study was done to assess and compare dentin tubule occluding effects of toothpaste containing BAG, mouthwash containing potassium nitrate and sodium fluoride, and a combination of toothpaste and mouthwash used for 60 days. 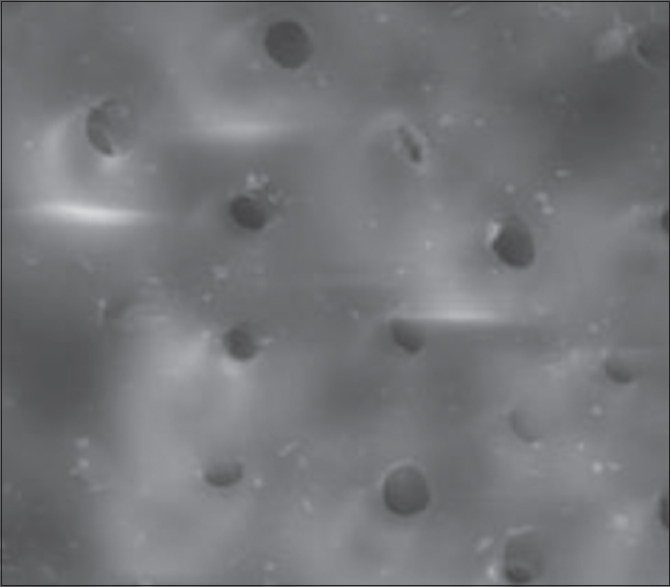 The percentage of tubule occlusion produced due to mineralization mechanism by the different agents was evaluated with scanning electron microscopy (SEM) analysis. As the toothpaste and mouthwash are two different modes of delivery, we also could appreciate the one producing better results. A total of 120 extracted premolars were collected, cleaned of gross debris, and sectioned labiolingually to obtain 60 mesial and distal surfaces. The specimens were placed in deionized water until dentine blocks were prepared. Each surface was wet ground to remove enamel and to expose a flat underlying dentine surface in the cervical region. Dentine blocks were prepared from the cervical region measuring 1.5 mm × 1.5 mm × 1.5 mm. One block was obtained from each flat cervical dentine surface. The blocks were ultrasonicated in distilled water for 30 s to remove the particulate matter resulting from cutting. Blocks were mounted in acrylic resin to stabilize while brushing. Smear layer was removed by etching the blocks in 6% citric acid for 2 min and rinsed in distilled water. The blocks were stored in distilled water during the experimental period. Group 4: Specimens brushed with SHY-NM toothpaste for 2 min and after 30 min, rinsed with SHY-OR mouthwash for 1 min, twice daily for 60 days. The toothpaste used in the present study was SHY-NM toothpaste (Group pharmaceuticals). Toothpaste group slurries were prepared in a dilution of 1:3 toothpaste:water mixture. The blocks were brushed using a power brush for 2 min twice daily. The mouthwash used in the present study was SHY-OR mouthwash (Group pharmaceuticals). In this group, the specimens were dipped in mouthwash for 1 min twice daily. For the combined group, blocks were first brushed for 2 min with the same toothpaste and then dipped in mouthwash for 1 min. To remove the excess slurry or aqueous solution, test samples were rinsed in distilled water for 10 s, after each procedure. From each group five samples each were taken and examined under SEM on the 3rd, 7th, 21st, 28th, 45th, and 60th day. 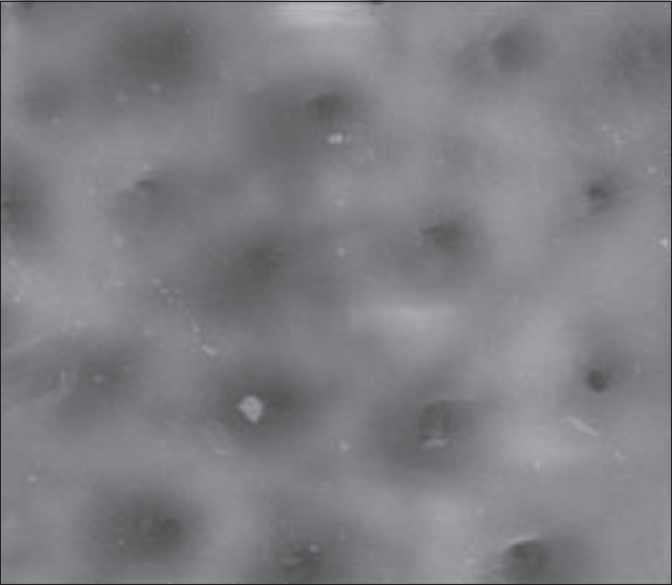 The standardized SEM microphotographs were analyzed according to the above scoring criteria by two blind observers. Chi-square test was used to determine the difference among groups with SPSS 22.0 software (SPSS Inc,). A P > 0.05 was regarded as statistically significant. The present study evaluated the dentinal tubule occluding effect of mouthwash, toothpaste, and combination of both, applied twice daily for 3, 7, 21, 28, 45, and 60 days [Figure 1], [Figure 2], [Figure 3] and [Table 1], [Table 2], [Table 3]. 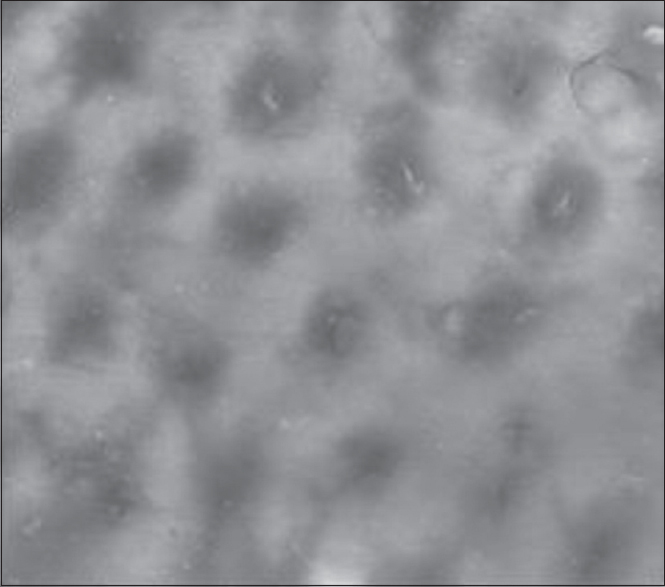 At the end of 3rd day, dentinal tubules in samples of Group 2 and Group 3 were mostly unoccluded (Score 4) whereas Group 1 all had dental tubules in completely open form (Score 5) [Figure 4] and [Figure 5]. At the end of 7th day, samples in Group 2 and Group 3 were partially occluded (Score 3). In Group 1 samples were mostly unoccluded (Score 4) [Figure 4] and [Figure 6]. At the end of 21 days, dentinal tubules in majority of the samples were almost occluded (Score 2) in Group 2 and Group 3. Overall, toothpaste group showed slightly better results as compared to combination group followed by mouthwash [Figure 7]. At the end of 28 days, all the samples in Group 2 and Group 3 were completely occluded (Score 1) followed by the mouthwash Group (Score 2 and 1) [Figure 7] and [Figure 8]. 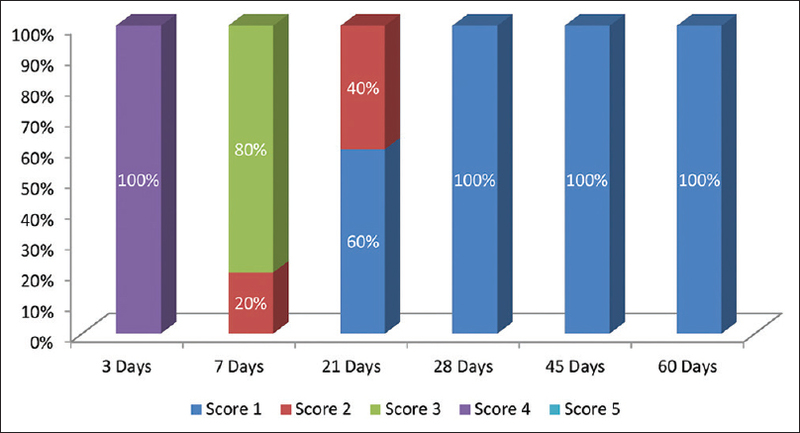 At the end of 45 and 60 days, all the groups showed complete occlusion (Score 1) of dentinal tubules [Figure 8]. In all the groups, there was a steady increase in dentinal occlusion from day 3 to day 60. Maximum dentinal occlusion was seen with toothpaste followed by combination group and then mouthwash group from day 3 to day 28. In the 45th and 60th day, all the groups showed complete occlusion. Treatments for DH can be self-administered by the patient at home or applied by a dental professional in the dental office. At home, methods tend to be simple and inexpensive and can simultaneously treat generalized DH affecting many teeth. The various desensitizing agents used can be classified as toothpaste, mouthwash, or varnish based on mode of delivery. Based on the hydrodynamic theory, dentine hypersensitivity is related to the flow of fluids within the dentinal tubules, and this fluid movement is directly proportional to the fourth power of the radius. 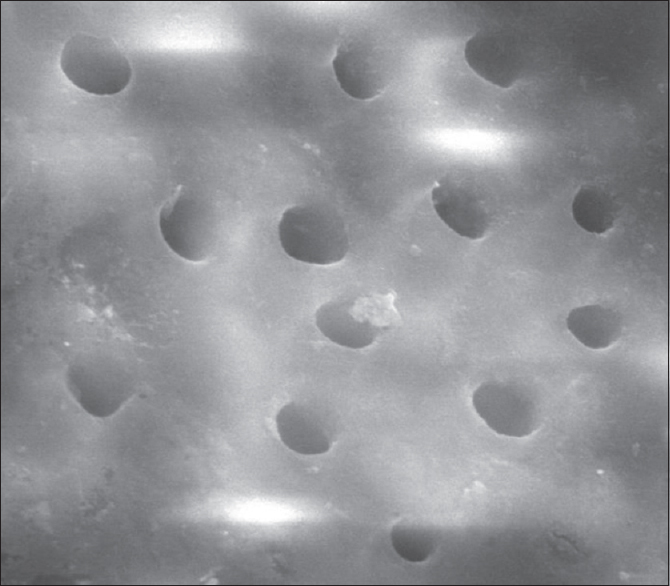 As a consequence any reduction in the radius of the tubule opening would be expected to reduce dentine permeability and effective in treating dentine hypersensitivity. This property of various desensitizing agents administered in different forms is evaluated in the present study. In the aqueous environment around the tooth (saliva) sodium ions from the BAG particles rapidly exchange with hydrogen cations (in the form of H3O+) and this causes release of calcium and phosphate (PO4−) ions from the glass. A localized, transient increase in pH occurs during the initial exposure of the material to water due to the release of sodium. This increase in pH helps to precipitate the extra calcium and phosphate ions provided by the BAG to form a calcium phosphate layer. As these reactions continue, this layer crystallizes into hydroxycarbonate apatite onto the tooth surface and occludes the dentinal tubules. These dentifrices were shown to be significantly more effective than both strontium chloride and placebo control toothpastes after 6 weeks use. Furthermore, when dentin surfaces treated with NovaMin were exposed to 6% citric acid for 1 min, and artificial saliva for 24 h there was only partial loss in occlusion, when compared to potassium containing silica-based pastes which showed complete loss. Therefore, the complete dentinal occlusion achieved within the first 3 weeks was maintained until the end of 2 months in case of NovaMin toothpaste. It has been shown that the innovative BAG-containing toothpaste occludes dentinal tubules and resists acid challenge. In the present study, toothpaste containing calcium sodium phosphosilicate (CSPS) showed better results compared to other two groups from day 3 to day 60. Clinical evaluations of CSPS for the treatment of DH have recorded statistically significant and clinically positive results. Moreover, it has demonstrated a strong antimicrobial behavior in vitro, which reduces symptoms of DH by preventing bacteria to induce pulpal response. NovaMin toothpastes occlude the dentinal tubules and enhance the mineral content of the surface would make the surface less susceptible to further damage. Many of these products may help in releasing calcium directly and additionally provides a surface that encourages mineral formation. In the present study, at the end of 7th day, the toothpaste and the combination group showed partial occlusion while mouthwash was mostly unoccluded. Toothpastes were used for 2 min twice daily and the presence of abrasives might be the major reason for dentinal tubule occlusion producing thicker smear layer. Mouthwash was used for 1 min twice daily and the absence of any abrasives might have resulted in lesser occlusion. At the end of 21 days, toothpaste group showed more dentine occlusion followed by combination group and mouthwash. At the end of 28 days, toothpaste and combination group showed complete occlusion while few samples in mouthwash group were not completely occluded. At the end of 45 and 60 days, all the groups showed complete occlusion of dentinal tubules. The use of SHY-OR mouthwash alone has shown least amount of dentinal tubule occlusion. According to Wilchgers and Ermert and Kim, the desensitizing effect of potassium nitrate is due to the increase in concentration of extracellular potassium around the nerve fibers which causes their depolarization, avoids repolarization, and blocks the axonic action. This blocks the passage of nerve stimulus, resulting in inactivation of the action potential. In the present study, potassium nitrate was used as mouthwash. Mouthwashes usually are administered in lower concentrations compared to dentifrices because of the risk of being swallowed. Therefore, mouthwashes are usually recommended as an adjunctive method along with the toothpastes. According to Pinto et al., this dentinal occlusion may be attributed to the abrasive content (calcium carbonate) rather than potassium nitrate itself. In the present study, the absence of abrasives in SHY-OR mouthwash may be the reason for lesser dentinal tubule occlusion. A study done by Markowitz showed that the use of SHY-OR mouthwash alone and in combination with toothpaste showed decrease in sensitivity scores. However, most of the studies indicated that twice daily brushing using SHY-NM toothpaste provided best results. The duration of DH clinical trials depends on whether they evaluate the short-or long-term effects of a product. A previous study suggested that 8 weeks is a suitable duration as it becomes difficult to distinguish between original DH episodes from a recent occurrence as the duration increases. According to the included clinical trials, relief from pain associated with the use of CSPS toothpaste is likely to be cumulative with continued use. Thus, a follow-up of 4 weeks is usually recommended to obtain significant CSPS results compared with placebo or a positive control. A previous clinical study done by Sharma et al. reported that both potassium nitrate containing desensitizing toothpaste and mouthwash is equally effective in reducing sensitivity within 4 weeks evaluation period, despite the different application procedure. Kielbassa et al. evaluated that the presence of fluoride agents in desensitizers reduced DH within 4 weeks and resulted in constantly low-sensitivity scores in long-term (6–12 months) periods. The results of our study showed that toothpaste form and the combination form are better than mouthwash alone. Therefore, it can be suggested that brushing twice daily with NovaMin toothpaste or a combination with 3% potassium nitrate/sodium fluoride mouthwash for duration of 1 month produced good dentinal tubule occlusion. In the present study, combination group showed almost similar results compared to the toothpastes. This is in accordance with previous studies which have shown that mouthwashes are always used in combination with toothpastes. In all the three groups, complete occlusion was observed after 3 weeks. Any desensitizing agent used should, therefore, be administered for a minimum period of 1 month. Continued usage of these agents for a duration of 8 weeks showed complete dentin occlusion over the whole study period. Further studies should be aimed at longer periods of dentinal occlusion (6 months–1 year). As DH is subjective in nature in vivo studies on efficiency of various desensitizing agents in different forms, frequency and duration are recommended. There was no change in the dentinal tubule occlusion found in the 45th and 60th day compared to the 28th day among all the groups. Mahale S, Badade P, Panjwani A, Vaidya P. Dentinal tubule occlusion by desensitizing dentifrices: SEM study. IOSR J Dent Med Sci IOSR-JDMS 2015;14:21-4. Sharma S, Shetty NJ, Uppoor A. Evaluation of the clinical efficacy of potassium nitrate desensitizing mouthwash and a toothpaste in the treatment of dentinal hypersensitivity. J Clin Exp Dent 2012;4:e28-33. Pinto SC, Pochapski MT, Wambier DS, Pilatti GL, Santos FA. In vitro and in vivo analyses of the effects of desensitizing agents on dentin permeability and dentinal tubule occlusion. J Oral Sci 2010;52:23-32. Rahardjo A, Aa N, Adiatman M, Maharani D. Efficacy of A toothpaste containing 5% potassium nitrate in desensitizing dentin hypersensitivity. Asian J Pharm Clin Res 2016;9:345-7. Arnold WH, Prange M, Naumova EA. Effectiveness of various toothpastes on dentine tubule occlusion. J Dent 2015;43:440-9. Saeki K, Marshall GW, Gansky SA, Parkinson CR, Marshall SJ. Strontium effects on root dentin tubule occlusion and nanomechanical properties. Dent Mater 2016;32:240-51. 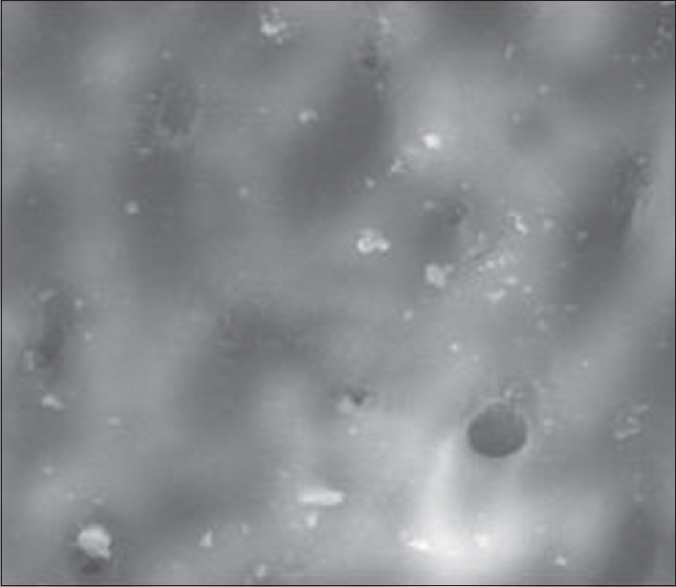 Mehta AB, Kumari V, Jose R, Izadikhah V. Remineralization potential of bioactive glass and casein phosphopeptide-amorphous calcium phosphate on initial carious lesion: An in-vitro pH-cycling study. J Conserv Dent 2014;17:3-7. Pathan AB, Bolla N, Kavuri SR, Sunil CR, Damaraju B, Pattan SK, et al. Ability of three desensitizing agents in dentinal tubule obliteration and durability: An in vitro study. J Conserv Dent 2016;19:31-6. Pillai VP, Neelakantan P. Desensitizing toothpastes for treatment of dentin hypersensitivity. Int J Pharm Tech Res 2013;5:1769-73. Pradeep AR, Agarwal E, Naik SB, Bajaj P, Kalra N. Comparison of efficacy of three commercially available dentifrices [corrected] on dentinal hypersensitivity: A randomized clinical trial. Aust Dent J 2012;57:429-34. Markowitz K. A new treatment alternative for sensitive teeth: A desensitizing oral rinse. J Dent 2013;41 Suppl 1:S1-11. Zhu M, Li J, Chen B, Mei L, Yao L, Tian J, et al. The effect of calcium sodium phosphosilicate on dentin hypersensitivity: A Systematic review and meta-analysis. PLoS One 2015;10:e0140176. Kielbassa AM, Attin T, Hellwig E, Schade-Brittinger C. In vivo study on the effectiveness of a lacquer containing CaF2/NaF in treating dentine hypersensitivity. Clin Oral Investig 1997;1:95-9.